Coin collecting is the provenance of numismatists with numismatics being largely involved with the study of coins and currency. The coins that are typically seen in our auction rooms are English, British or World coins in origin. 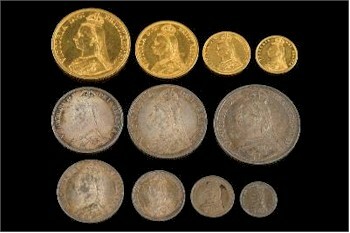 A Queen Victoria 1887 Eleven Coin Specimen Set (FS25/183). English coins date from those minted duing the Saxon and Norman periods through to those that have been hammered or more recently that have been die-stamped. English and British coins are usually categorised by the reigning monarch, leading to some reigns seeing many different official images of the ruling sovereign during their reign while others were very short-lived, making coins from the period very rare. A large extensive single collection of German and German Independence State Coinage (FS25/617). Most English coins that appear regularly in auctions date from the Tudor period onwards. Anomalies due to errors are particularly sought after due to their rareness as are coins that were minted in relatively small quantities such as the Victorian gothic crowns (so-called because of the gothic portrait of Victoria by William Wyon) and George V 'wreath' crowns (because of the wreath of shamrock leaves with thistles and roses intertwined on their reverse). A George III Spade Guinea (FS27/174). 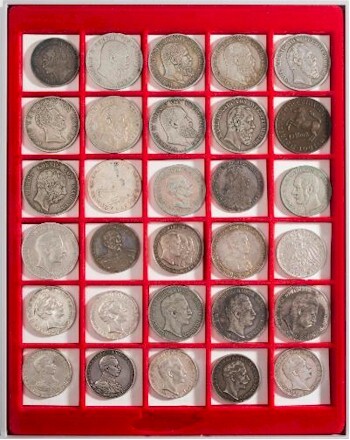 Continental European coins from Germany, France and Italy are popularly collected too. Common Gold Sovereigns and Half-Sovereigns are usually handled at Bearnes Hampton & Littlewood by our Jewellery Department.